Probyo Digestive aids in the body’s natural process of digestion. 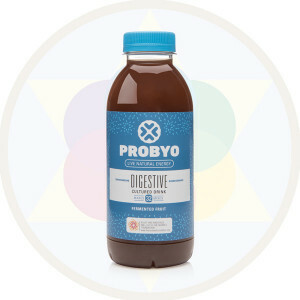 Probyo is a naturally sugar-free lacto-fermented fruit juice, which is rich in live lactic acid bacteria, as well as unlocked and bio-available nutrients and microbial biogenics. Probyo provides live microbes to unlock your natural energy, including multiple Lactobacillus and Bifidobacterium species, which are known to stimulate positive health benefits. It aims to promote general health and well-being. Live probiotic microbes boost the immune system, aid digestion and unlock energy for the body. Storage: Store at room temperature or refrigerate. Keep out of direct sunlight and store in a cool place, keeping the lid tightly closed. Sedimentation (floating white ‘dots’) may form. This is normal as this is a natural product. Important: do not accept if seal is broken. Dilute 15ml (1 tablespoon) or more as desired with water or fruit juice. Enjoy daily or more frequently. Once opened, consume within one month if not refrigerated and two months if refrigerated. Ingredients: Purified and structured water, lactic acid bacteria (bifidobacterium spp. lactobacillus spp.) and 3.58% fermented fruit juice (sugar free).